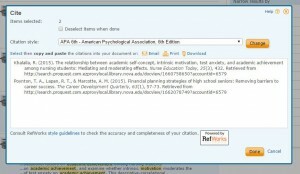 Check out these links that can help you format your APA citations. Writing & Communication Center — The NSU Write from the Start Writing and Communication Center (WCC) is an innovative workspace where students, consultants, and faculty come together, in person and online, to talk about writing and communication. Staffed by trained professional and peer writing consultants, the WCC offers individualized writing and communication assistance to all NSU students. Students are welcome to work with on all types of academic writing and communication projects at any stage of the writing process from brainstorming to editing. Students at all levels, in all programs, and in all formats can make in-person and online writing center appointments. SharkWrites is the NSU Write from the Start Writing and Communication Center’s (WCC) site for online writing resources designed to help you enhance your writing skills. The NSU Tutoring and Testing Center (TTC) provides assistance to students in a variety of academic support services both in-person and online. Read through their appointment policies. The TCC focuses on subject area tutoring, critical thinking skills, and academic success strategies including study plan development, time management skills, and test taking strategies. If you need writing or editing assistance you should contact the Writing and Communication Center instead of the TCC. Refer to SharkWrites for more information about program-specific requirements. APA Videos in LibraryLearn – NSU’s LibraryLearn has short video tutorials on a variety of library resources, search strategies, and citation management. Many library databases have a citation generator feature. Some will format a reference list from selected articles, others will format a single citation that you can copy and paste into your document. Be aware that citation generators such as these, can often make mistakes in the retrieval statement. 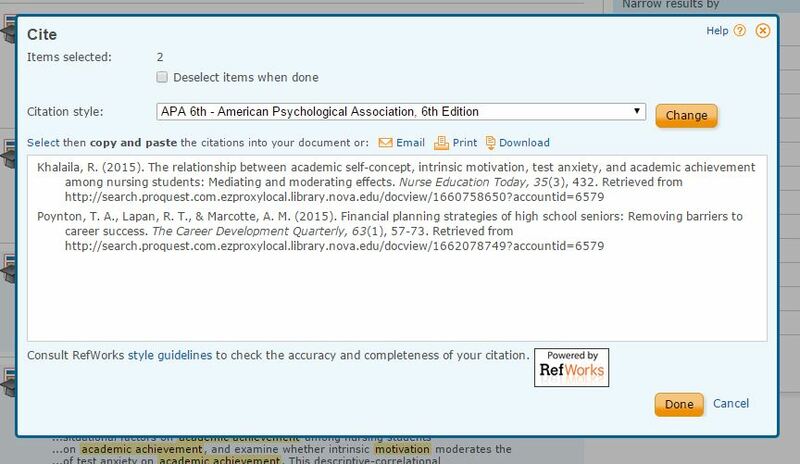 In the example below from a ProQuest database, the generator has used the URL from the browser window instead of the URL for the journal’s homepage, which is what APA requires if there is no DOI number. Nova Southeastern University provides EndNote software to faculty, students, and staff of the university. Visit the NSU Libraries’ EndNote guide for more information and to download the software.